Readers of poetry and listeners of classical music share something in common: each must engage in a push-pull to extract maximum benefit. For music, yielding to surrounding sound rewards the listener with a powerful auditory stimulus, but for poetry, a slow crawl through its language becomes akin to the discovery of 2,000-year-old graffiti scrawled on the foundation of an ancient building by its makers—such immersion bringing an entirely new reality. 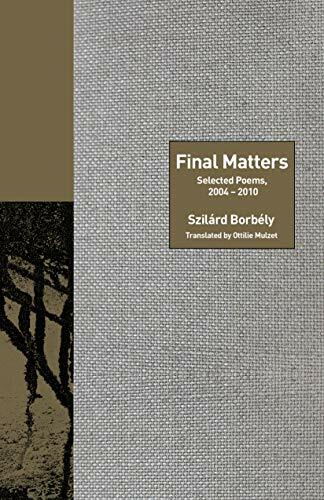 It is precisely this kind of serendipitous discovery that will reward the reader of Final Matters by Szilárd Borbély, translated by Ottilie Mulzet. “material due to the force of the word. There is more than meets the surface in Borbély’s shift into the dialogue of the rabbis to discuss the finer points of God and creation, God and man, God and life. Borbély uses their dialogue as an effect of abstraction from the harsh topics he has chipped out of the stone-cold past of inhumanity accepted as if nothing separated it from the accepted and the commonplace. It is the power inherent in such abstract examination that allows the poem to reach deep into a reader’s chest and displace the space needed to refill breath. That the poet can find a way to so affect any reader is a remarkable achievement and something that distinguishes his work. It raises the bar for poets and, in effect, pays tangible homage to deep-seated longings to somehow correct the past. The struggle suggested within the work on each page competes with the headstones the Nazis defiled, then stole, and subsequently made into paving for footpaths in places like Treblinka, stating that we will never be able to create something palatable about such a past, and that all of humanity needs to take note. In this well-assembled collection of poems translated by Ottilie Mulzet, the translator has shown readers the unbelievable depth the poet has offered the world through his work. The tragedy of his death in 2014 will forever be a blow to the work of committed poets to bring to the mad world a sense of reason and right. In Borbély’s case, through a kind of craft that is undeniably in a world of its own, translator Ottilie Mulzet has provided an amazing Hungarian poet with a voice in English, opening a door to a readership that might otherwise never have found out the potency of his words, showing-off the lost world to any who would find it, and thus, bringing the dead back to life. It takes a poet of significant stature to approach the topics that Szilárd Borbély has shown he was able to access. And to bring them into the cold steel light of morning for any reader to taste, is a feat few have managed with the same skill shown-off in this book. Any reader will find a mine full of treasure within Final Matters, and every reader of poetry should have a copy of this excellent translation of Borbély’s masterful work.